Biogeography is a branch of geography often summarized as ecology with a spatial focus. My areas of interest are in the distributions of species and the environmental factors that influence the limits of those distributions. In this time of rapid environmental change, this research interest motivates a conservation focus. I have worked on numerous habitat restoration projects from wetlands to deserts and from coast to mountains. 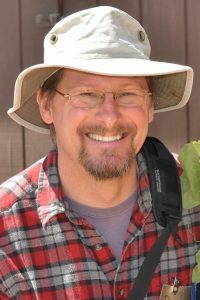 Current research is focused on species range dynamics over time, effects of fog on coastal ecosystems, and computational techniques for aiding field biologists and conservation planners. I have worked with numerous collaborators on developing computational methods for reserve network selection to improve habitat connectivity and to account for climate change. Work with Loo Botsford focused on marine conservation—adapting habitat-based reserve selection algorithms to explicitly address long-term population persistence by incorporating the effects of long-distance larval transport. My dissertation research was in phytogeography (distributions of plant species), and the role of micro-climate and other site factors influencing range limits. My primary study site was on Santa Cruz Island where I examined the role that fog plays in the water and energy budgets of Bishop Pines growing on the western part of the island. Intensive weather monitoring, stable isotope analyses, and modeling approaches showed a high dependence of these trees on fog and overcast to make it through the annual summer drought, and particularly to survive the more intense episodic droughts that drive range limits. I continue to collaborate on fog-related research projects on the Channel Islands and coastal California. Baguskas, S.A., J.Y. King, D.T. Fischer, C.M. D’Antonio, & C.J. Still. (in press) Impact of fog-drip versus fog immersion on the physiology of Bishop pine saplings. Functional Plant Biology. Fischer, D. T., C.J. Still, C. Ebert, S.A. Baguskas, & A.P. Williams. 2016. Fog drip maintains dry season ecological function in a California coastal pine forest. Ecospheres 7(6):e01364. 10.1002/ecs2.1364. Fischer, D.T., J.W. White, L.W. Botsford, D.M. Kaplan, & J. Largier. 2011. A GIS-based Tool for Representing Larval Dispersal for Marine Reserve Selection. The Professional Geographer, 63(4): 489-513. White, J. W., L.W. Botsford, E.A. Moffitt, & D. T. Fischer. 2010. A decision-analysis approach to designing MPA networks in the face of uncertainty about fishery stock status. Ecological Applications, 20(6): 1523-1541. Fischer, D. T., C.J. Still, & A.P. Williams. 2009. Significance of summer overcast and fog to the ecology of coastal California endemic species. Journal of Biogeography, doi: 10.1111/j.1365–2699.2008.02025.x. Fischer, D. T., H. Alidina, C. Steinback, A. Lombana, P.I. Ramirez De Arellano, Z. Ferdana, & C. Klein. 2008. Ensuring Robust Analysis. in Marxan Good Practices Manual. (eds. J. Ardon, H.P. Possingham, & C. Klein). 70–89. Pacmara, Vancouver, BC. Alidina, H., D.T. Fischer, C. Steinback, Z. Ferdana, A. Lombana, & F. Heuttmann. 2008. Assessing and Managing Data. in Marxan Good Practices Manual. (eds. J. Ardon, H. P. Possingham, & C. Klein). 50–65. Pacmara, Vancouver, BC. Williams, A.P., C.J. Still, D.T. Fischer, & S.L. Leavitt. 2008. The influence of summertime fog and overcast clouds on the growth of a coastal Californian pine: a tree-ring study. Oecologia, 156 (3): 601–611. Fischer, D. T. & C.J. Still. 2007. Evaluating patterns of fog water deposition and isotopic composition on the California Channel Islands. Water Resources Research, 43. Fischer D.T. & R.L. Church. 2005. The SITES reserve selection system: a critical review. Environmental Modeling and Assessment 10 (3): 215–228. Pyke C.R. & D.T. Fischer. 2005. Selection of bioclimatically representative biological reserve systems under climate change. Biological Conservation 121 (3): 429–441. Fischer D.T. & R.L. Church. 2003. Clustering and compactness in reserve site selection: an extension of the biodiversity management area selection model. Forest Science. 49:555–565. Fischer D.T., S.V. Smith, & R.R. Churchill. 1996. Simulation of a century of runoff across the Tomales watershed, Marin County, California. Journal of Hydrology. 186:253–273.